Every fall over fifty thousand Snow Geese fly from Wrangel Island, Russia, to our Skagit valley. 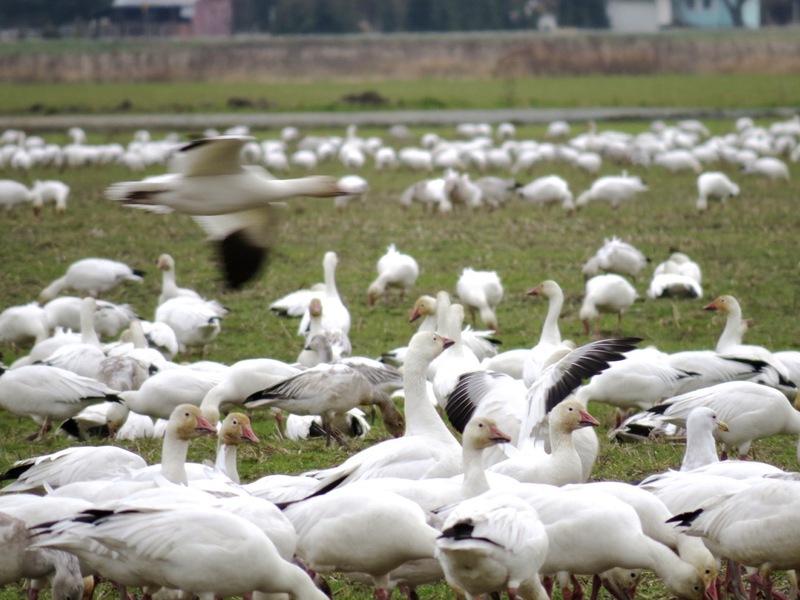 In order to reach these preferred wintering grounds, the flocks fly very high and in narrow routes, stopping at familiar stopovers before landing and wintering in our friendly Skagit farms and wildlife areas. 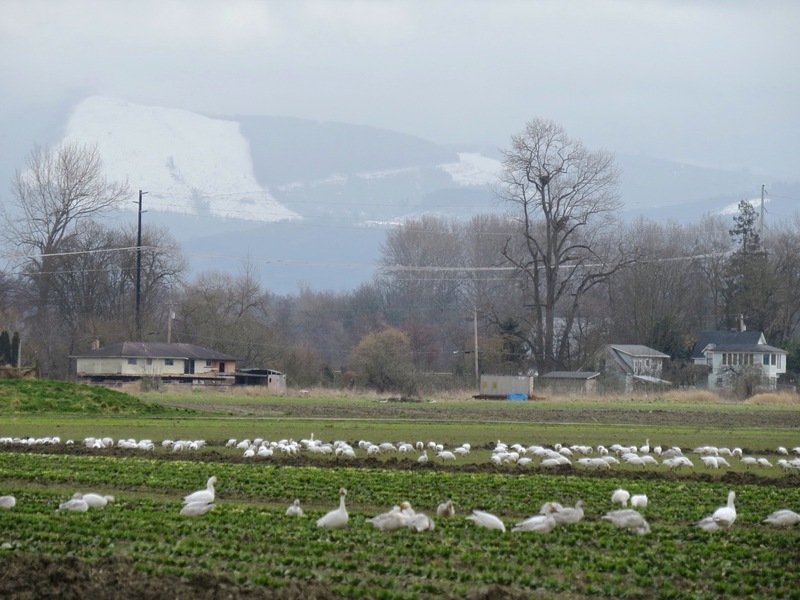 Exclusively plant eaters, Snow Geese come to the Skagit area for the milder winters and to feast in agricultural fields, some planted specifically for these geese, in a “Barley for Birds” program. Years ago these geese were in danger status, but now they are in danger of over-population. Geese are hunted locally from October to January, in very specific locations, so it is still safe to go view. Close up of grin patch—black lipstick-right? 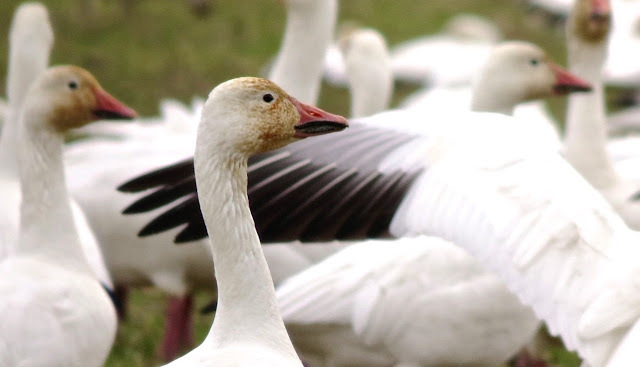 Snow Geese have a unique grin patch (looks like a line of black lipstick), and their wing tips are black. The Blue Goose is a dark morph of the Snow Goose, has a white head, and is rare here. Snow Geese usually form their long-term pair bonds in their second year, with the females setting up nesting in the same location as they were raised (philopatric). Nestlings leave their swallow nest built on slightly higher ground within hours, but the parents protect their 3-5 young, which usually stay as a family for 2-3 years. 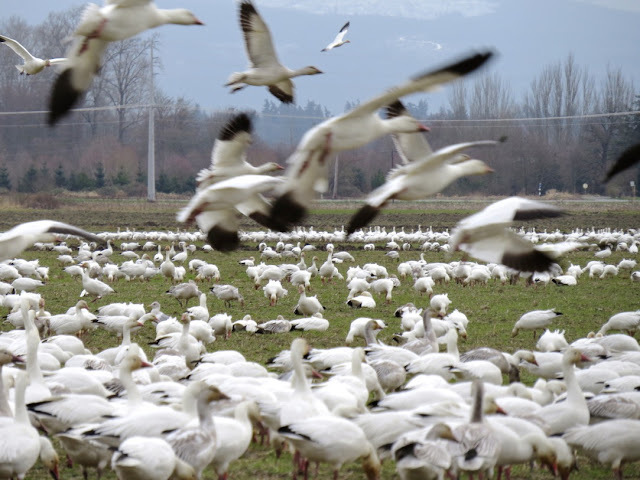 Some of the best viewing for the Snow Goose is at the Washington Department of Fish and Wildlife’s 225-acre Fir Island Farms/Hayton Snow Goose Reserve. From Interstate 5, take Exit 221 (Lake McMurray/Conway) and turn west. Drive 0.1 mile. Turn right (west) onto Fir Island Road. Drive west 3.2 miles. Turn left (south) at Washington Department of Fish and Wildlife sign. Drive 0.5 mile to parking area (Discover Pass is required for this parking) There is a short trail along the dike offering views of Skagit Bay and opportunities for shorebird and waterfowl viewing. No hunting is allowed at this site. 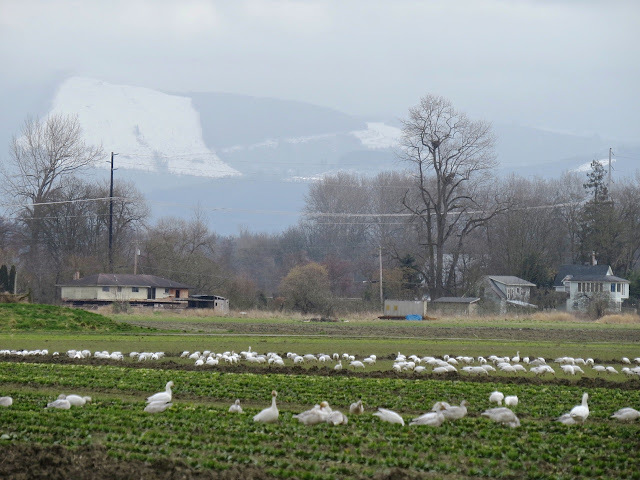 If you are driving to view Snow Geese, Trumpeter Swans, and Tundra Swans, some shoulder in Conway and La Conner parking is prohibited, and it is against the law to walk in private property, to which local farmers and owners rightly object. Be considerate of local traffic. It is also energy taxing for the flocks to be spooked into flying. So, if you want to see the geese flying, just wait a little while in your car -- thousands of geese are still arriving.